Yes, forgive me for taking so long to update my blog. It’s been quite a hectic week last week. After redang trip, i was assigned to a site visit at Angsi Platform on Friday. But before going to Angsi, I decided to take leave and drove home, visiting my sick granny at Melaka GH. It was a sad moment for me. Before we go to that, let me tell u bout my trip to Redang. It was fabulous! Handling 8 people (including me!) is not an easy task. 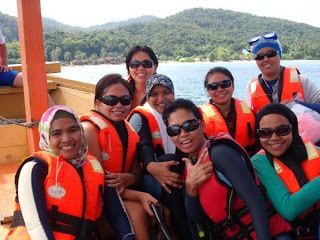 The plan starts when I asked my good friend, Zue for snorkeling trip to Redang back in January. One of my friends in KL office heard bout it and she decided to join us. 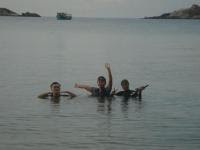 It was my third snorkeling trip. 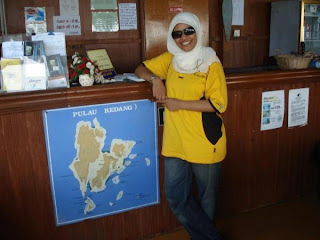 I’ve been to Lang Tengah and Perhentian. 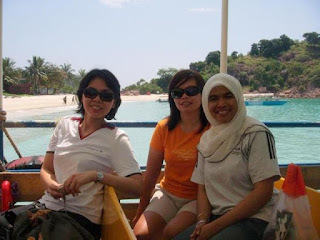 Lang Tengah with Zue and to Perhentian with MMC staff (our family day). We pushed off from Kerteh (my house) around 615am. We had to be in Kuala terengganu at 830am for head count and the ferry depart at 9am. At first, it seems viable. It usually took 2 hours to get there. But what we failed to acknowledge was, the Sukma 2008 has just started. We got there around 830am, but the parking area was already full. Luckily, the day before, I called the agent and she told me bout the possibility of the parking area to be full, so I had managed to arranged with my housemate, who live in KT and park our car at her house. But the journey to her house was quite a disaster. First, I wasn’t familiar with KT area. Second, it was Sukma, the traffic was bad. Finally, my housemate had to fetch us. We got to the jetty at 9pm sharp (thank God! ), and the people has started lining up to board the ferry. I was relieved. The journey to Redang took about 1 and a half hours. 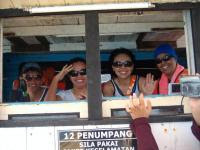 When we reached Redang, we had to be transferred to another boat which took us to our resot, Mozana Bach Resort. 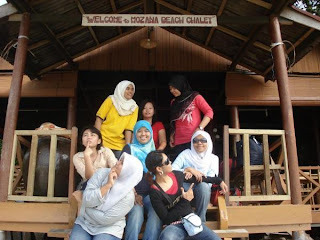 It is a small resort, and at first, I feared that my friends wouldn’t enjoy staying there coz along the journey, we have seen many big and beautiful resorts compared to Mozana. I think they were thinking the same thing, but the whole trip itself is more enjoying, mostly due to the fact that it is a small resort. If we were to stay at bigger or more wellknown resorts, we wouldn’t get to enjoy the close friendship we had with the staffs and doing things our way. Yes, that was my second relief. We booked 2 rooms, 4 people each. It was a so-so room. Not recommended if you wanted comfy and luxury la. Not here. But the plus point is the air-cond, but we only enjoyed it for few hours. We reached Mozana at noon. Almost 12pm. Just in time for lunch. The food also a so-so. 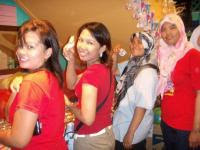 But later, we had no complaint at all bout the food, coz when you are hungry, everything just feels nice and delicious! After unpack and relaxing, bout 2pm, it’s the start of our first snorkeling trip. I can’t remember the name of the location. As I imagined it before (and also my previous snorkeling experience), I witnesses bout the same fish and corals, nothing much different. But again, after the third time, of course there is not much different. Except, if I were to try scuba diving. That thot did cross my mind but I know diving will become an addiction and I don’t know whether I can satisfy that with my busy schedule and limited budget now. But it will come. Soon. The one that I really wanted to see is Christmas tree. During my previous trip at Lang Tengah, Zue did see it, but I didn’t. it’s a small tree that sits on a big coral. When you touch it, it goes into hiding. Just like “semalu”. It has many colors, yellow, blue, etc. this time, I asked the guide to show me and he did. But I didn’t get to touch it as I have to dive down. Err..my swimming skill is not that great yet. 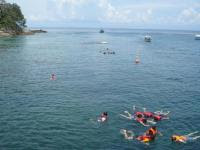 Nnt la…but watching my friends enjoyed the snorkeling is priceless. 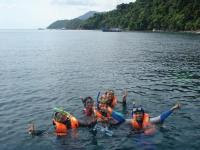 This is the first time snorkeling trip to most of us. I had experienced that feeling. Watching the underworld is like going to a different planet. Observing the colourful fish and corals is really addicting. When we reached the resort, it was latenoon already, bout 5 pm. 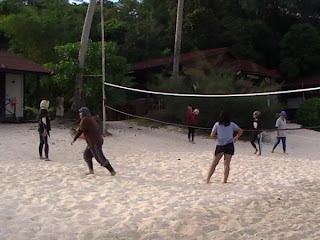 Instead of changing our attire and lepak (swimming is tiring), we decided to have a volleyball match. Later, we went to mandi and get ready to dinner. The dinner was supposed to start at 8pm. But that day, the first day, the staff ushered us to have the dinner earlier. Then, we knew what was wrong. The generator couldn’t be started but no one can fix it. We were told that we had to survive the nite without electricity. No lights, no aircond. Initially, we wanted to do beach trekking (or resort trekking), visiting other resorts in Redang with help of one of the staffs, but he was busy repairing the generator. We made our own karaoke that nite. Sitting by beach, all of us, sing anything that cross our mind. We saw the room facing the sea, opened their door to let the wind get in and cool down the room. But our rooms are located at the back, near the jungle. When we got to our rooms, we decided to do the same. Left the door ajar, to let the wind. But when we heard the sound of animals, we closed it straight away. We had to stand the heat. 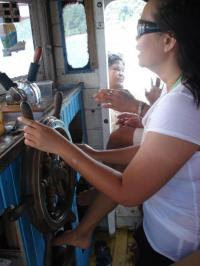 But I was fast aslept that nite, tired with the driving and snorkeling. I didn’t feel a thing. But too bad to some of us, who couldn’t sleep at all, due to the heat. At breakfast the next day, we were told that the electricity was not guaranteed that day since it’s off day. The staff gave us option whether to stay (with no electricity) or go back and have some of our money back (the trip to be considered 2 day 1 nite trip with 1 snorkelling trip). We wanted to stay BUT, with option to be transferred to another room, the one facing the sea. Jealous abis tengok dorang bole bukak pintu kan!. The one in-charge of accommodation was reluctant at first, since they were expecting quite a huge number of guests that day but we were so persistent, she had no choice but to agree. 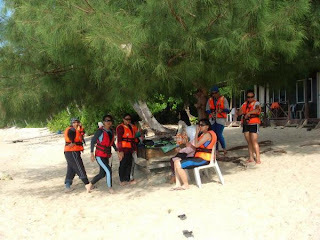 The snorkeling trip that day was to famous Marine Park and also the site near it. So many people there! The number of people there can be equalized to the number of fish in the sea. It’s a must go place for all resorts in Lang tengah, Perhentian and Redang. Tu yang jam. There was a joke : one of us asking on what type of food do the fish there eat since the corals are quite dead. Some of us yelled, bread brought by us la, apa lagi! Yes, almost all tourist brought bread to attract the fish. Put the bread on your palm, the fish will come to you. But, it’s not easy to touch them! I saw one tourist brought a plastic bag and filled it with bread. The fish enter the plastic bag and bam..the tourist closed the other end. But we were not allowed to take anything there, so of course, she had to let it go after pegang that fish. The park has 2 main attractions: The giant garoupa and mural eel. I’ve seen the eel during my previous trip (It’s like a giant ular sawa with black skin. I was told that it wouldn’t harm human but would you really want to get near that animal, even though you knew it wouldn’t hurt you? Not me). But not the garoupa. But on that day, both the garoupa and the eel refused to get out from their shelter. I think mostly because they had been fooled so many times to get out, so, by the time we got there, dia dah letih nak kuar. On the boat back to the resort. Some of us wanted to be the pilot of the boat. Bole laa.. The one thing that really make this trip stand-out (for me laaa) is our quest for blue sand. When Zali (our tourist guide) told us that we’ll be going to watch blue sand, I thot that we get to see a huge blue sand area. I was wrong. When we get there, it’s just like any other beach. When zali began rubbing the sand with his feet, we were astounded. What the hell…suddenly, out of the blue (or should I say sand? ), a tiny blue fluorescent color shimmer. We were ecstatic! Summer org pun nak gosok the sand and produce that spark. The blue color originates from the color of the corals. The colors were brought by the seawater to the beach. The fluorescent color is short-lived. After shining for few seconds, it is back to ordinary sand. This is one thing that I didin’t get from any other snorkeling trip. So sad I couldn't capture the pix of the blue sand coz when the flash hits the flourescent color, it reflected, so no colors can be seen. 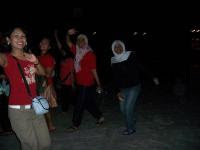 Later that nite, the electricity haad not been fully recovered but we were told that we could turn only the lights on. Our new room had air-cond and fan. We tried switched off the lights and turn on the fan. Just to see whether we’ll trip the generator but the plan did work out. No lights, OK but we just had to have the fan on. The last day at Mozana. It’s time to say goodbye! isk isk...aku baru je abiss baca sebena nya. hebat sangat aktiviti2 ko nih...aku lama2 duk sana dlu pun takde ke mana2. nampak sangat aku nih jenis2 tak adventure. apesal ko makin berisi skrg ni? byk makan ehh..hati manyak senang..